As we noted earlier today, Bernie was using the tweet to illustrate Trump’s prior commitment against cutting Medicare and Medicaid. “If he was sincere, then I would hope that tomorrow or maybe today he could send out a tweet and tell his Republican colleagues to stop wasting their time and all of our time,” he said. 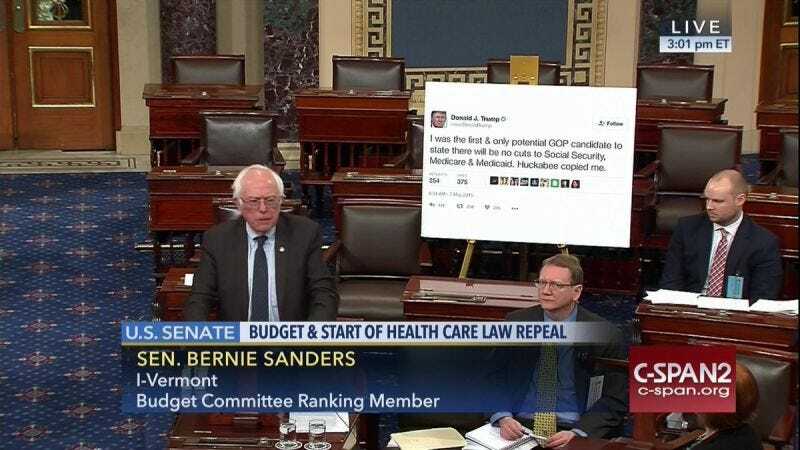 So, dear readers, we ask you: What large poster should Bernie have brought to the Senate floor? Leave your best work of art in the comments by Thursday at 9am, and we’ll show you the best in a new post.